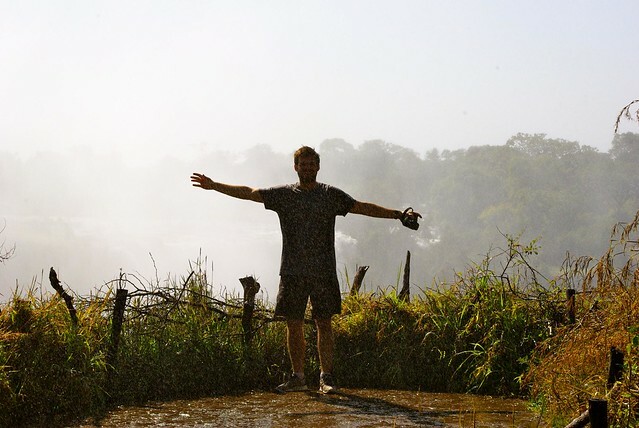 We signed up for a tour to Victoria Falls through our campsite, loaded into the van with 10 other fellow campers and started driving to…Zimbabwe? Our first tip would be make sure you know which country you are going to prior to the day you are actually on the tour. 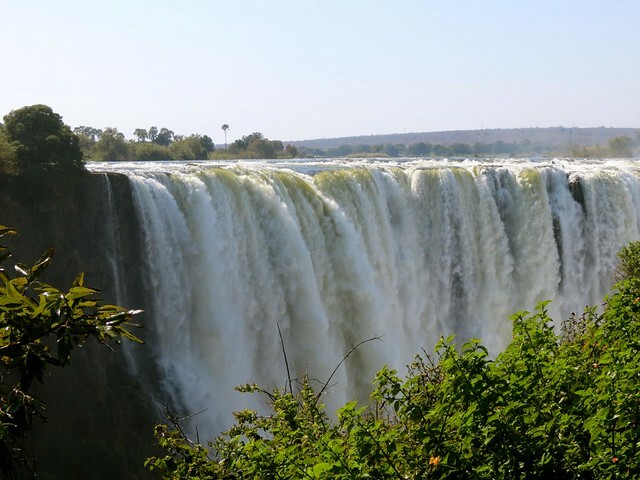 For us, it didn’t so much matter which side of the falls we went to but we had just had a rather unsettling conversation with a different campsite owner about how everyone went to the Zambia side because of problems in Zimbabwe. So…..you could say we were pretty pumped. 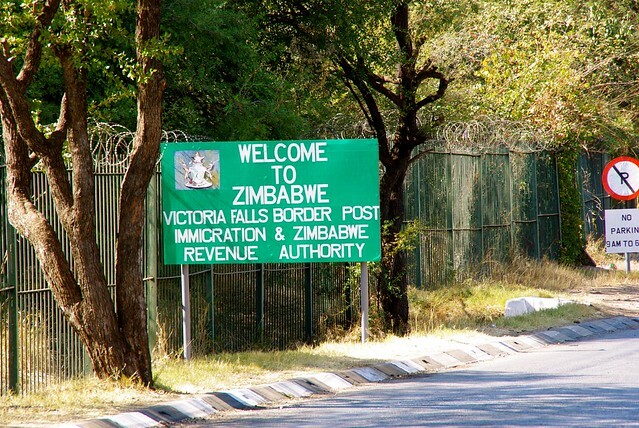 After an extremely disorganized border crossing (but I guess I have rarely had an organized one) we loaded into our second van of the day and were given a short history of Zimbabwe. This was entertaining since the first words out of our tour guides mouth was “Robert Mugabe is a very bad man and has done very bad things to this country”. Our jaws dropped as we looked around for the police to swoop in and arrest our driver. Understand that we just came from Thailand where if you even joke about the king you can go to jail for a very very long time. 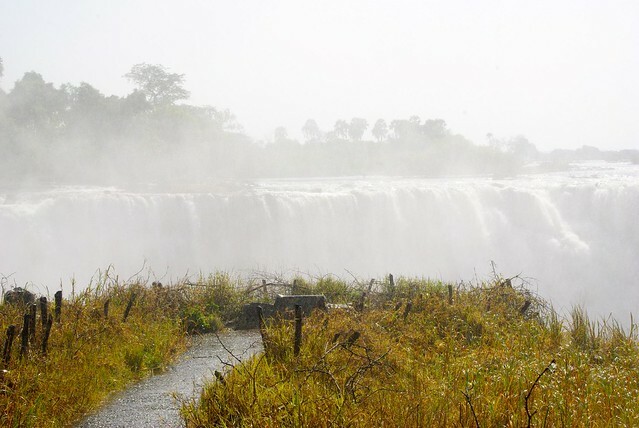 Anyways we proceeded to learn some interesting details about the country as we made the short trip from the border to Victoria Falls. When you first arrive in the parking lot there are plenty of stands offering for you to buy ponchos for the falls. Being the intelligent travelers we are, we convinced ourselves that it couldn’t be that bad and we don’t mind a little bit of water. Funny how quickly we learn lessons…Without ponchos you walk away from the falls completely drenched. 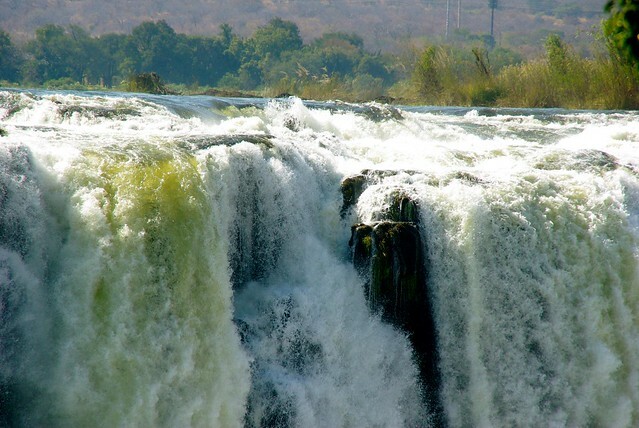 There is no way to avoid the massive amount of water that surrounds the falls. If you aren’t prepared for the amount of water you encounter at the falls you end up with photos that look like the one below. 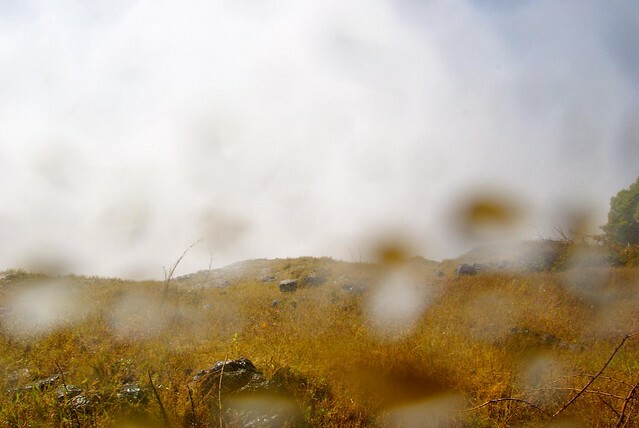 Not only does the lens quickly get covered with water to blur your photos, but your camera is getting soaked, which I don’t think is very good for it! 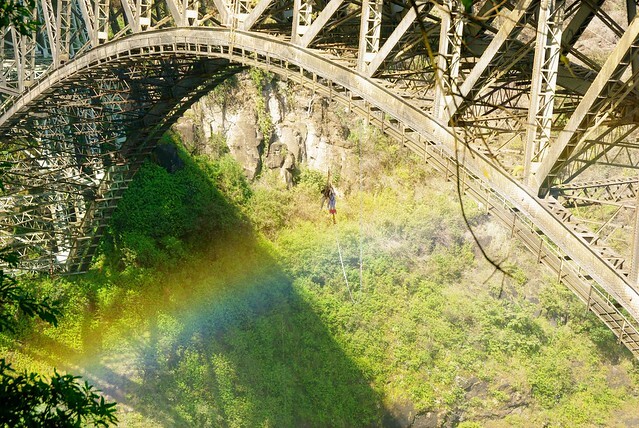 When you finish viewing the falls, the path will lead you past the famous bungee bridge. 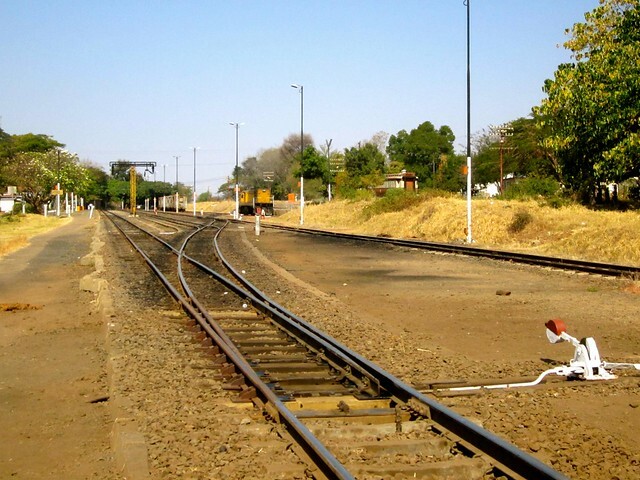 After leaving Victoria Falls you have a 5 minute walk to the main town area. Along the walk you will be bombarded by very good salesmen. They are selling Zimbabwean currency which was hilariously hyper-inflated Did I mention that the US dollar is the standard currency here? Yes, we bought a 50 trillion dollar bill. 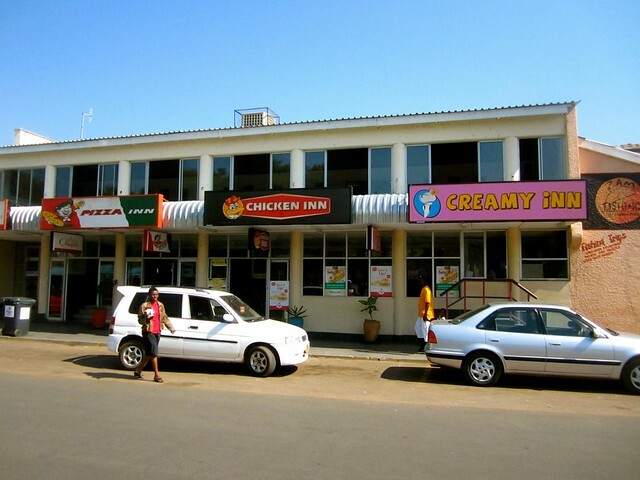 I know it will be tough to by-pass Pizza Inn, Chicken Inn AND Creamy Inn…but keep going! You will find Invuvu bar just across the street. 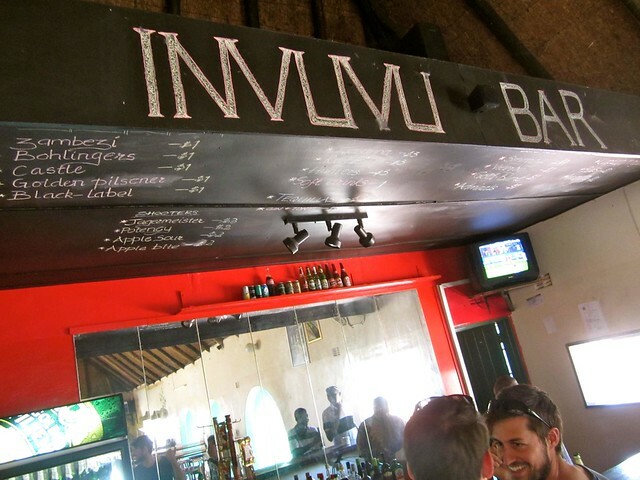 Invuvu Bar is only drinks and the menu is on the ceiling – try a local beer. We had the Zambezi and Bohlingers, both we enjoyed! The restaurant next door has food. Josh unfortunately left his sweatshirt and Chicago marathon shirt out to dry on a bench here and forgot about them until we crossed back into Botswana. If you see someone wearing them let us know! 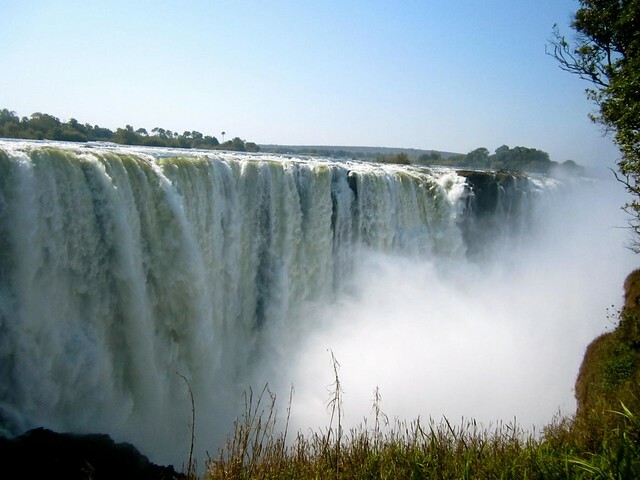 You can fly into Victoria Falls but it’s just as easy to hop over from Kasane if you’re already in Botswana. It isn’t cheap though. Our transportation from Kasane was $70, Zimbabe visa was $30, and park entrance was also $30 meaning an hour at the waterfalls cost about $260 for the two of us. Regardless, it’s another box checked off the list! LOVE the pictures! And whaaatt 50 trillion dollar bill? How awesome! I never buy souvenirs, but I couldn’t resist a 50 trillion dollar bill! 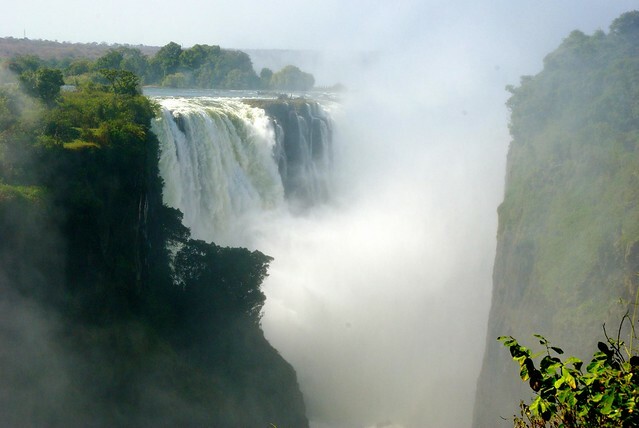 Guys — Thanks for the Victoria Falls memory flog and the great pictures. 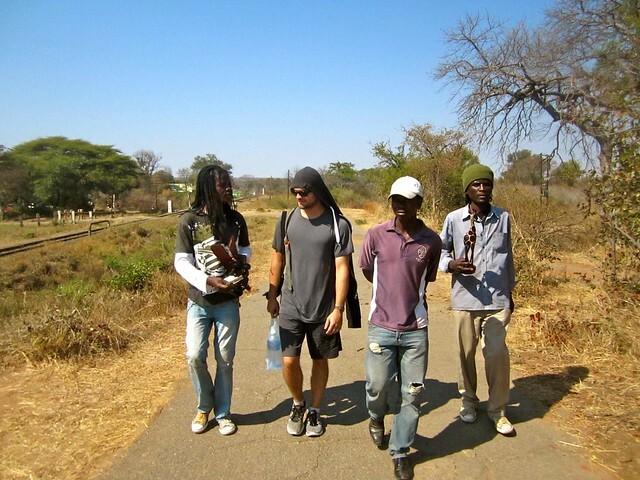 I can’t get away from thinking every day about the Africa road trip. Having dinner with a lady I know next week who is booked on an Overseas Adventure Tour safari to the RSA, Namibia, Botswana and Zim. I will share photos, books and maps. She’s going in December-January, so I wonder what changes in the land, waters and critters the seasonal difference will bring? Hope all goes well with you two. Any plans now for an Amazon river trip down stream into Brazil?? I’m sure it’ll be quite different in another season. I was surprised how dry it was when we were there. As I’m sure you’ve already seen, we did the Amazon river trip, but stayed in Peru. It was amazing!